It's relatively easy to lay down a few decent ideas, but turning them into fully-fledged arrangements is, arguably, the hardest part of music production. If you've got a hard drive full of cool 16-bar loops crying out to be assembled into songs, then read on for ten loop-busting arrangement approaches that you can put into practice right away. While DAWs are thought of as strictly linear sequencers, most now offer features geared towards arrangement experimentation. 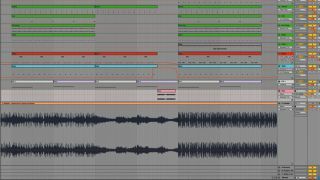 Ableton Live's non-linear Session View, Cubase's Arranger track and Logic Pro X's Arrangement markers allow you to concoct and 'perform' multiple arrangement ideas on the fly, the best of which can be printed onto the timeline at your leisure. Studio One 3's new Scratch Pads offers an extra timeline for trying out ideas independent from the main arrangement. Take time out to learn these features and reap their rewards. Many of your unfinished track ideas probably consist of one concept or 'theme' (ie, a chorus), leaving you listening to the same sounds over and over. Once you have two differing sections working well together, it'll be easier to branch off and make a third, fourth and fifth section. If you're bored with the same old loop, try making a completely contrasting section, or even concentrate on making two sections work well together - for example, a verse leading into chorus, or a breakdown building up into a drop. Once you have two differing sections working well together, it'll be easier to branch off and make a third, fourth and fifth section. If you're making music in a genre that adheres to 'DJ-friendly' arrangements, drag a commercial track into the project, and check out exactly how it's arranged. How long is the intro? When does the bass come in? How long before the second breakdown? Is there a long outro? Copy the track's structure in your own arrangement, using it as a template, and no one need ever know. Who says a great track needs to take hours and hours to finish? If you endlessly fiddle with an eight-bar loop without getting an arrangement down, you're probably working too slowly; after too much time listening to the same idea, you'll likely get bored of it, no matter how good it is! Instead, focus on working fast. Pull out all the stops and try turning your loop into a full arrangement as quickly as possible - perhaps even to a strict time limit - so you don't lose interest and focus. If anything seems to be slowing you down during this process, identify what it is, and look for a solution. You can even time yourself, giving yourself a deadline to finish a certain task, and once time's up, it's done. Recording long passages of synth/effects tweaking live to audio, then selecting the best bits to chop up onto the timeline, helps prevent endless tweaking of 'live' plugins and forces you to commit to audio via a dedicated record channel, freeze/flatten feature, or 'bounce in place'. By responding and reacting to your track in a live fashion, you'll often end up with cool FX and transitions that make your arrangement seem more natural and flowing. A track idea will often need additional ideas or sounds adding to progress the arrangement, but throwing in new sounds can sound disjointed and messy, especially if your aim is minimalism and groove. Instead, run parts of your track through extreme reverb or delay effects, then render results and mangle further. Or grab any outboard gear you can - a cheap cassette deck, an old '90s mixer, some guitar pedals - and run sounds through them. Run parts of your track through extreme reverb or delay effects, then render results and mangle further. Sending portions of track elements to creative return tracks (such as eccentric delays, long reverbs and mangling, glitchy effects) will generate plenty of extra material that can be printed to audio and processed further - and as these sounds derive from existing elements, they'll fit the tone and timbre of the track. We're all guilty of creating over-complicated ideas and dense loops, and you can easily end up trying to cram everything you've got into an arrangement - especially if you're basing it on a busy loop that you're already expecting to be the "climax" of the song - which may lead to a messy, convoluted track idea. Instead, use silence and contrast to your advantage. Remember that dynamics are an essential part of music. Take away expected sounds, or even fade them to silence. As well as contrasting quiet against loud, set off low bass with sparkling treble, subtlety with intensity, and so on. Filter or fade parts in and out rather than having elements just stop and start; or identify sections where the listener could get bored, and hammer them with a startling sound out of nowhere! Don't be afraid to use clichés - many of them are clichés because they work! Every genre has its own, but a few dance music examples include four crashes on the last bar of a phrase, 16th-note snare rolls, a white noise sweep, an ever-doubling kick drum build-up, or a 'trance-gated' sustained vocal. You can use them to lead the listener comfortably through a track, or if that sounds a bit too safe, surprise the listener by using clichés in an unexpected way. And, if all else fails, drop everything out for a bar or two and throw in a cheesy sample! Begin with a short eight- or 16-bar loop of a track idea, which should contain all the core elements you'll need, then duplicate the idea throughout the project for five or so minutes. This should help you visualise the completed track and set yourself an 'ending' to work towards, as the original loop will probably be the 'climax' of your song. Now, start from the beginning and form rough sections (intro, breakdown, chorus, etc) by removing, muting or filtering parts as you go. Above you can see an arrangement before and after employing this technique. Looped parts can become stale and repetitive, but instead of throwing them out or elaborating on them, simply change the accompanying parts instead, to 'reframe' them. Change the chords used beneath a repeating melodic phrase to create variation; switch the beat up to double- or half-time, to vary the pace throughout the track; pitch material up or down by an octave or transpose the key of all musical material for added interest or to develop the theme. You could try experimenting with MIDI data, through stretching or compressing regions to alter their timing, or using MIDI plugins in different parts, creating arpeggios or chords that weren't there before. All of this can help maintain a sense of cohesion throughout your track, as well as helping you get the most out of its main hooks and phrases.